Hot on the heels of the first show of 2019, Clonmel World Music is back in Raheen House Hotel next week Thursday 24th January with a very special band, Laura Cortese and the Dance Cards. It is the band’s first visit to Ireland, and the Clonmel show will be their very first Irish show. The band are over in Ireland to play at the Tradfest in Dublin and they are also doing a very small tour, playing shows in Belfast and Kilkenny along with the Clonmel show. Clonmel World Music has been after this band for a few years, and when the opportunity came up to host them in Clonmel for their first Irish show , it was a no brainer ! It has been with her band, The Dance Cards that she has made the biggest impact. It’s bold and elegant fare, schooled in the lyrical rituals of folk music and backed by grooves and scintillating vocal harmonies that have become a hallmark of their performance. Writing in RnR magazine, David Innes awarded them his “Most Memorable Gig of The Year” vote. 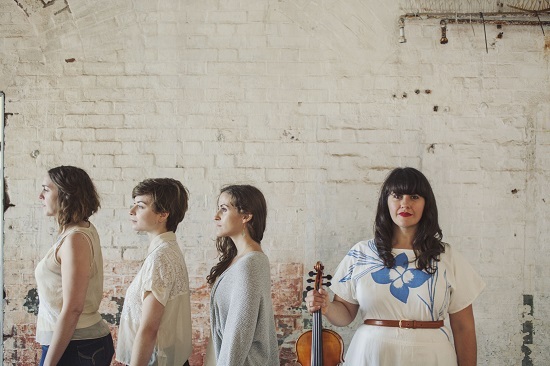 Since then, the four-piece has taken both Shetland and Orkney Folk Festivals by storm, and kicked off 2018 in style, flying in for two big shows at Glasgow’s Celtic Connections festival, promoting their current album, California Calling, on Compass Records, which has been winning them rave reviews and much radio exposure. It was Album of The Week on the Radcliffe & Maconie show at BBC Radio 6. Awarding the album a 5-star review (there were many) at Acoustic magazine, Julian Piper called it “stunning”. Laura Cortese wears many hats: fiddler, singer, songwriter, multi-instrumentalist,bandleader, community builder, and creativity instigator. 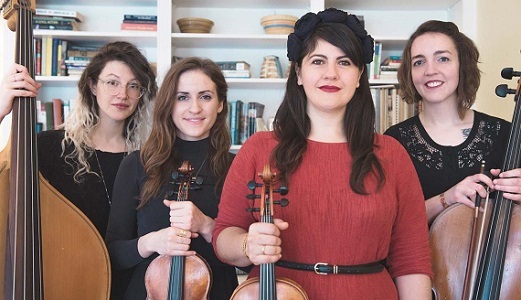 Her band Laura Cortese & the Dance Cards is a quartet of singing string players whose original music draws from diverse traditions and experiences to create a broad-minded yet clear-eyed sonic vision. It’s based in the lyrical rituals of folk music while exploring new territories, moving seamlessly from gauzy, ethereal vocal harmonies to rowdy indie-rock percussion to propulsive fiddle melodies directly from Appalachia or Scotland. Before forming the Dance Cards, Laura Cortese’s career included stints as an instrumentalist with Band of Horses, Pete Seeger, Rose Cousins, Jocie Adams (of the Low Anthem), and Uncle Earl. The collective credits among the Dance Cards exist on a broad continuum from Darol Anger to Amanda Palmer, from the symphony to prog rock, and even into protest music like Pete Seeger and Michael Franti. They have also twice served as U.S. State Department cultural ambassadors, traveling to India, Kazakhstan, Uzbekistan, Bangladesh, Ukraine, Estonia, Montenegro and Greece to exchange musical traditions and foster cultural understanding. Their lyrics deftly explore themes of heartbreak, independence, and the restless search for a home in the world. It’s a new kind of pop music: born from the folk tradition, traveling the roads of 70s California, and delivered with power and heart. Laura Cortese & the Dance Cards have toured and performed at premier festivals throughout the United States, Canada, the UK, Europe, and Scandinavia. Doors for the gig will open at 8pm. There will be no support act, and the band will start at 9pm prompt. Tickets are available online on www.clonmelworldmusic.com; in Marians Bookshop Clonmel ; South Tipperary Arts Centre Clonmel ; from Gerry Lawless on 086 3389619.